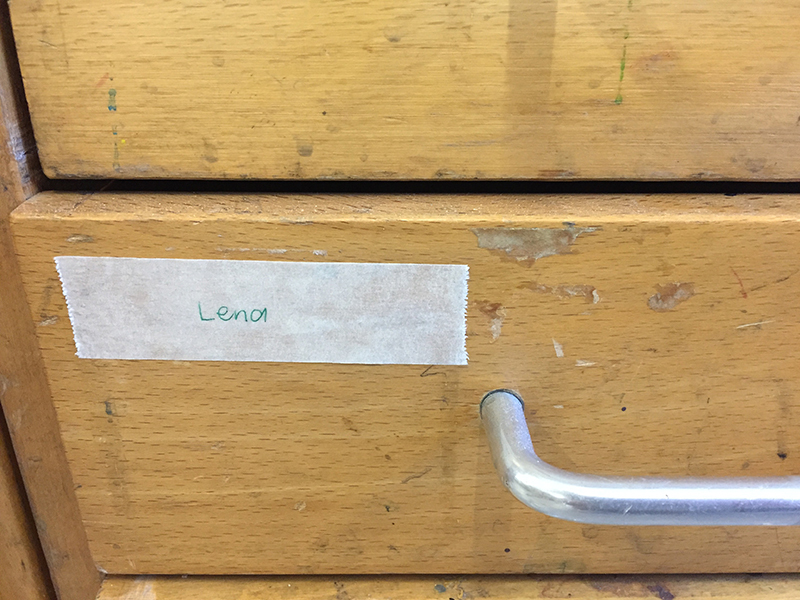 Lena Wurz completed an MA Visual Arts in Book Arts at Camberwell in summer 2017. 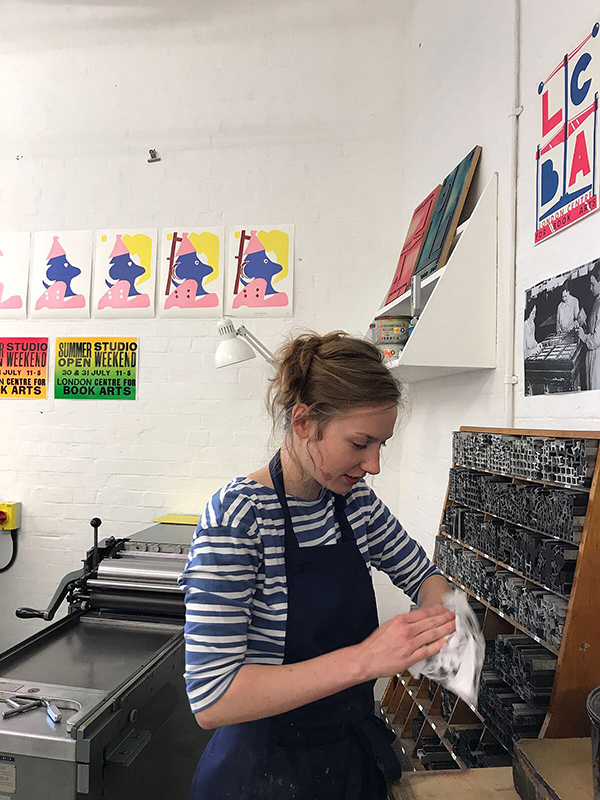 Lena was granted the London Centre for Book Arts (LCBA) residency which she undertook at the end of 2017. 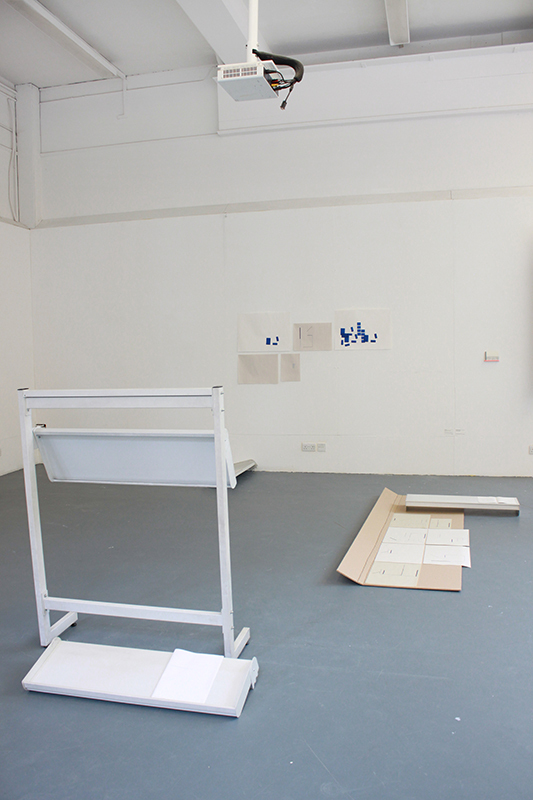 Below, is an intimate journal about her residency and her thoughts since leaving Camberwell. This is the idea I had at the start of my three month residency at LCBA. The MA Summer Show had just finished, I went on a little trip to Antwerp as a treat for my graduation, and now life after all the safe environments of uni begins. When I first arrive at LCBA, itt suddenly feels very real to not be a student anymore. It’s on Fish Island in Hackney Wick, there used to be a peanut factory in the area and the shape of LCBA itself reminds me of its past as a box-folding factory. It looks as if it could be the enlarged upper inside corner of a box. All these places are journeys away, the complete opposite to everything so conveniently positioned within close-by postcodes during my MA. If I stepped out onto the street leading down to River Lea and numerous building sites overlooking the Olympic stadium right now, and someone asked me what I do, I could officially say I’m an artist-in-residence. It makes me feel a little bit proud, but I also don’t know what it means. I know I have access to all the beautiful printing presses for three months, the foil blocking presses, the well-equipped bindery, a risograph printer and the satisfying guillotine. But in-residence, does that mean I am a resident of the LCBA space now? I still live in my old flat share room, I haven’t travelled to another city even to be accommodated by a studio, the way I always imagined residencies. If I am a resident, what are the LCBA studio members to me while I’m there? And are Simon and Ira, who set up LCBA five years ago and run it since, my landlords? How am I going to exist in this space for three months while continuing the rest of my life and working part-time? 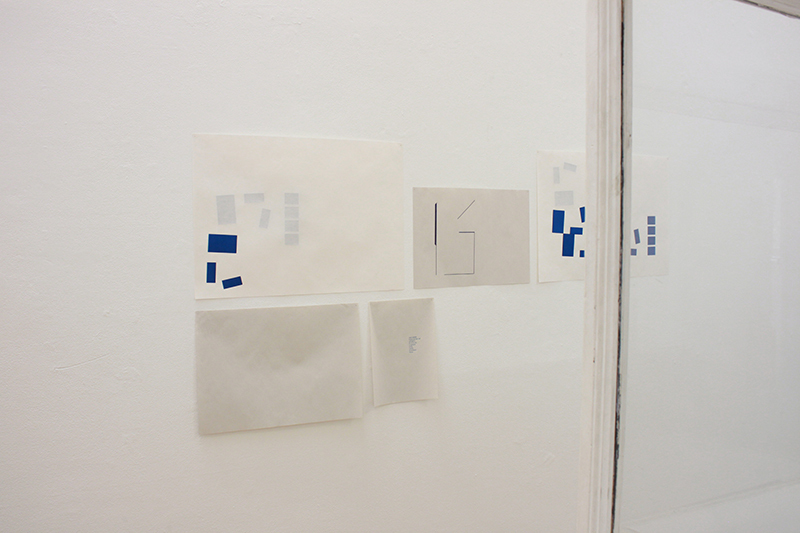 Previously I had set my mind onto a new body of work that continues on from my summer show installation, but focuses on the time and space of the residency: I would work with whatever the space offers and a body of work would be finished while I’m in-residence. 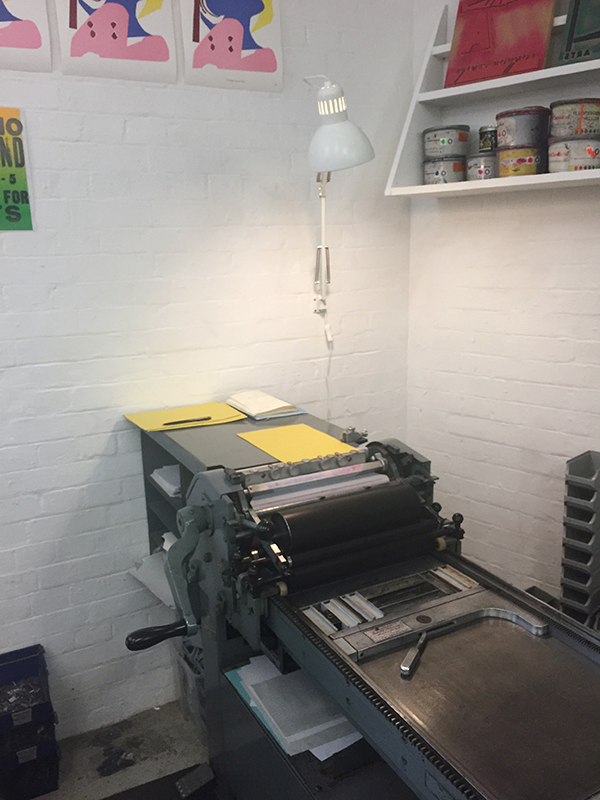 I think the real inhabitants of LCBA are the presses and tools and the furniture. There is furniture in the little bookshop, furniture full of cases holding the fonts and furniture elements in the letterpress workshop, furniture with incorporated drawers and shelves for the bookbinding equipment, furniture in the kitchen, and there is the cabinet hosting publications that have moved in as LCBA’s subtenants. 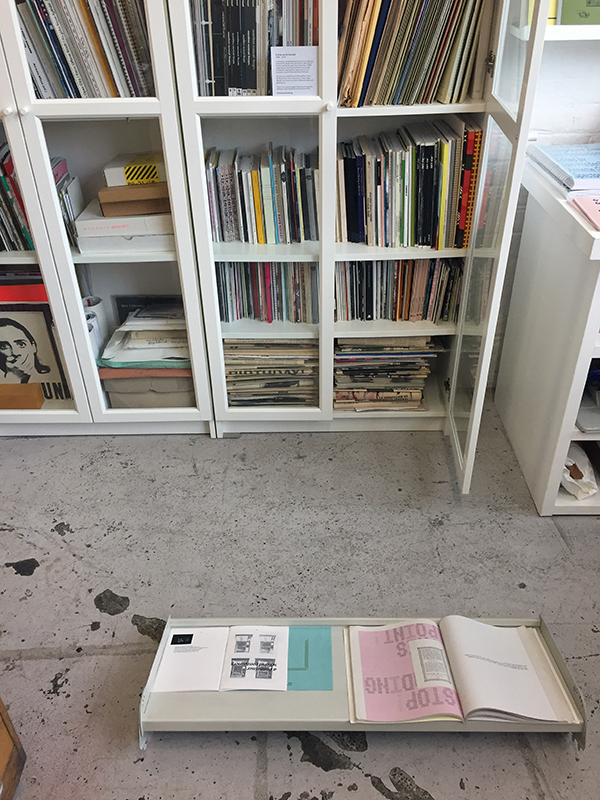 The publications have something in common, they have been donated by publishers attending the Publish And Be Damned (PABD) independent publishing fairs (2004-2013). Now they are in the custody of Three Letter Words, an organization which uses forms of distribution outside of gallery spaces to engage the public. I’m more like an AirBnB guest than a subtenant, but the publications are a little bit like me after all. So I’ll work with them. First, I sit with them. There are many of them and they live on 11 shelves behind glass doors. 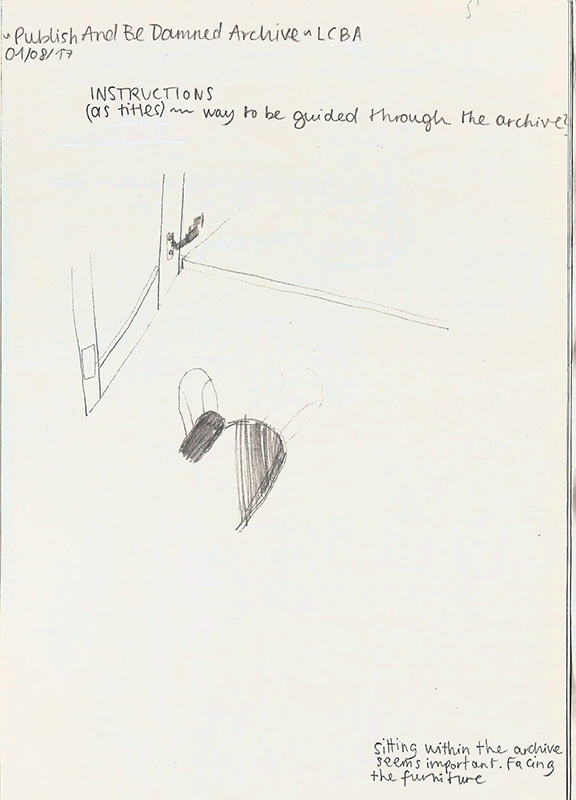 Sitting within the archive seems important, the cupboard doors open, facing the furniture. I am offered a stool by Ira. Sometimes I’m in the way of people moving through the workshop space. When the space was furnished, they didn’t accommodate for an additional body next to the cabinet. If I became part of the furniture I might not block the way anymore. Quickly I have created myself a first comfort zone. Sitting by the archive I ask the spines of the publications what to do. There are so many of them that I need some guidance. The spines with instructions as titles are the loudest and I’m happy at this point to take some suggestions. They say for example Cut + Paste; Save Me From What I want; Ways of Working. A Mock Up; It Has To Be This Way. 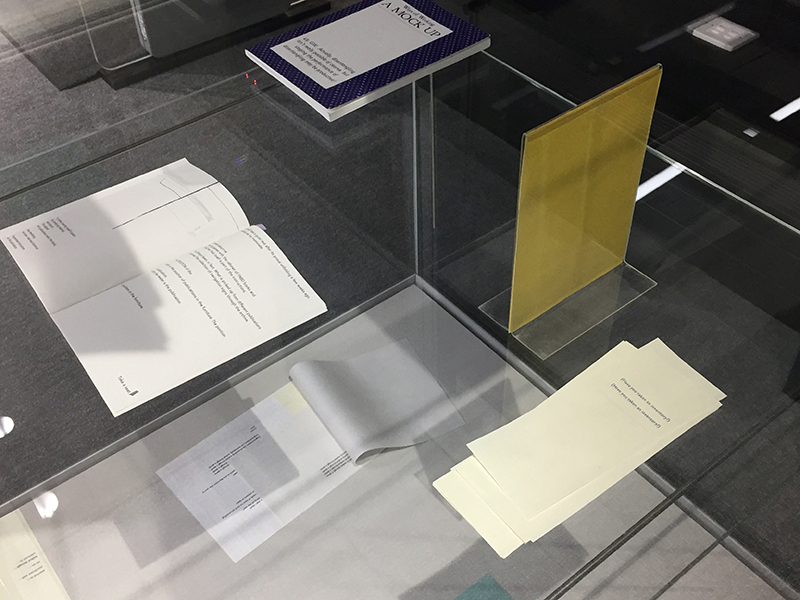 Interestingly enough, the content of these publications are connected to their layout in the same way as I imagined my prints to work with the space. At the moment Three Letter Words is in the process of digitising the PABD archive which increases my interest in working with the publications. Three Letter Words aim is for the archive to be freely accessible to everyone. It makes me wonder how this archive could be connected to other platforms, so that people are aware of their access. How can everyone, literally everyone, be presented with the possibility of accessing? Who is the audience? During my time on the MA my work developed into site-specific installations. I combine prints, books, objects and texts. 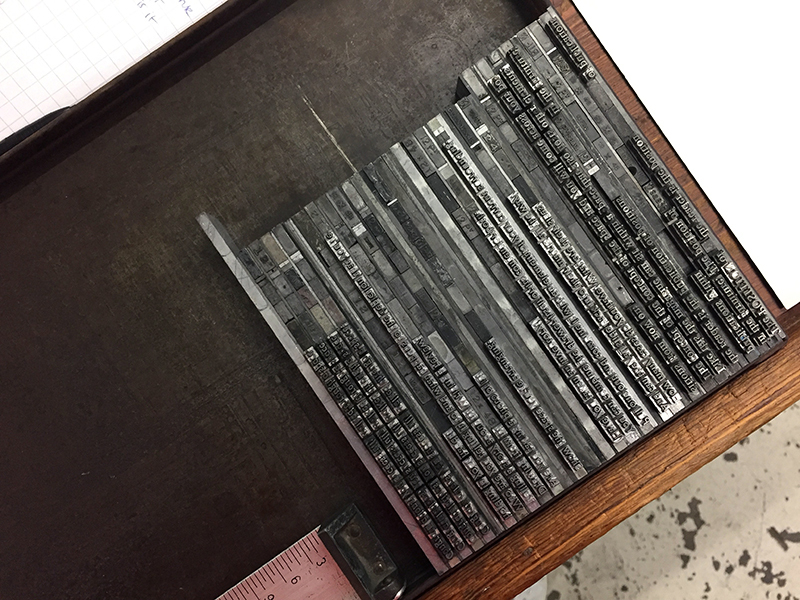 In the past two years a key process for me was traditional letterpress printing. 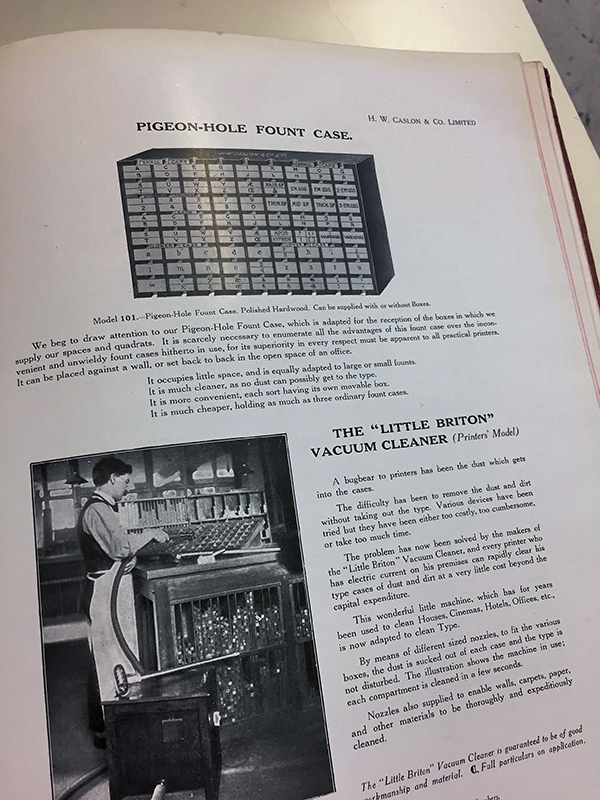 Its use today emphasizes how printing enabled the start of distributing news and ideas. 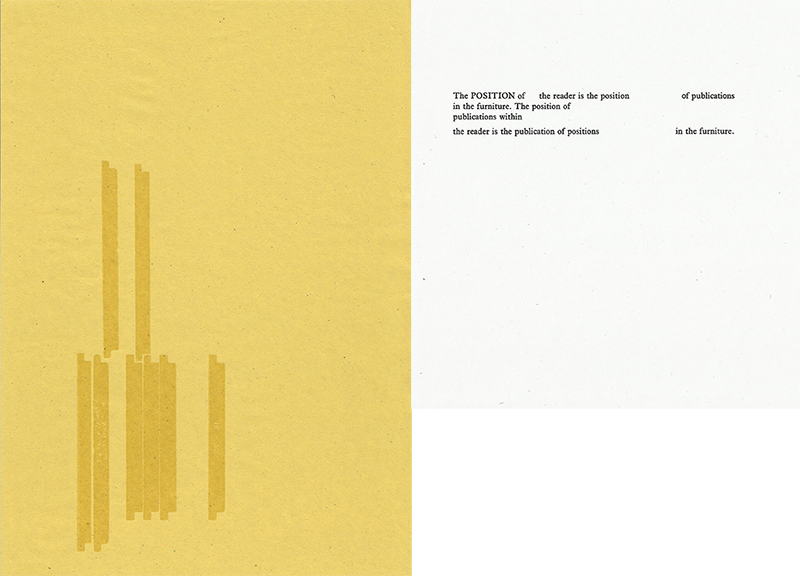 I combined letterpress printing with the arrangement of geometrical shapes that respond to architectural structures. It led to experimenting with how writing can be installed in spaces alongside objects, my own writing being a mixture of found text and narratives developed in the space I work in. ‘(all of which are in your pouch)’​, my summer show piece, connects these experiments in space with ideas of distribution. It is the culmination of a series of installations around my Cantilibra library shelf. The process of installing is mirrored in the presentation the audience experiences. Different elements, such as prints, texts and objects form a space; we relate to the shapes of the space and respond to it. This shows through our immediate behaviour. 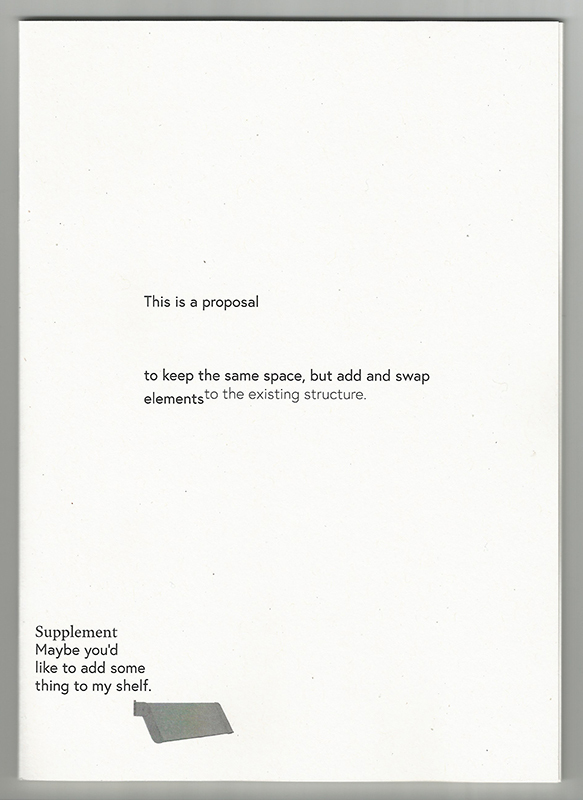 All of the exhibited elements could exist separately, but also in a group, they can add to a space or form a new one. They are flexible. In the everyday spaces we move through we come across characters that also shape the space. ‘(all of which are in your pouch)’ is a landscape of characters and shapes constructed for the audience to move through and to become aware of. So I’m a resident of the space of LCBA now, and I will react to its inhabitants, the publications, like one would react to a group of people. They gave me suggestions and I reacted to them by adding my own writing. I also make photocopies to keep a record of how the writing I include in my texts was originally laid out. Simultaneously the copies are material to add to the sketches I have been drawing when sitting in front of the cabinet. What I collect from different publications is the space I accumulate, the navigation signs for my walk through the archive. I do need to come out of this first comfort zone though. After all the writing and inventing of characters that inhabit spaces I inspect the different fonts in the print area (on the opposite side of the room). Then I jump straight to the cases with the letterpress furniture. I have been interested in furniture from the first moment James in the Camberwell Letterpress Workshop mentioned their name in our induction. Objects I can build with to give purpose to a space, I thought. The furniture is not supposed to be printed from, but to hold in place the type that is printed from. My first approach to letterpress was building three-dimensional floor plans from furniture and transferring them onto paper. I also stamped a lot. Maybe that is why I love developing children’s workshops. I express through building and stamping: objects familiar to children are very accessible to these processes. When they can be introduced to printing from their building materials, I feel like offering the children my arm to make a step towards developing their spatial understanding. By working with the layers of printed surface and the process of transferring from object to paper, their perception of themselves and people around them grows. 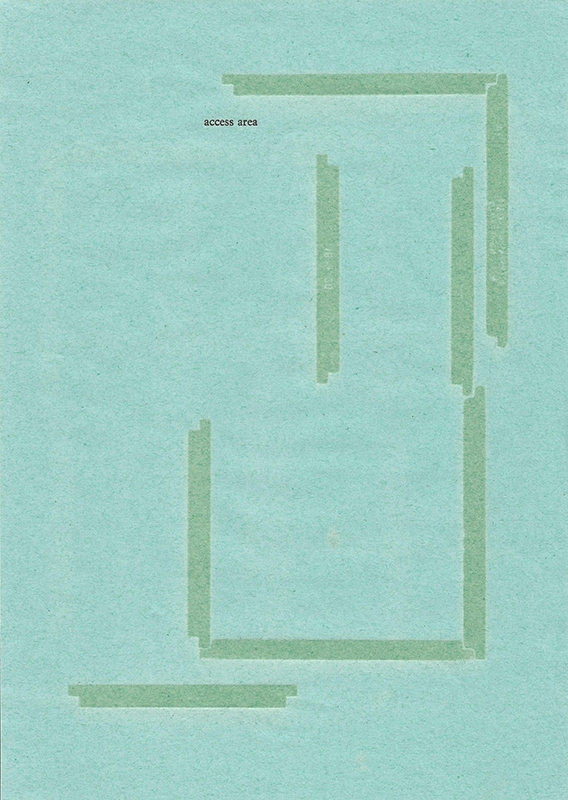 The archive hides a quote full of layers that makes me think of all this play and arrangement of spaces: “Social space […] that emerged in all its diversity […] with a structure […] reminiscent of flaky mille-feuille pastry”, from Henri Lefebvre’s The Production of Space (1991). After all the suggestions the spines gave me, and the writing I did, it is natural to continue the work progress with some construction work. This is when I meet the interlocking furniture. I like Lego, and attaching things with easy clicks gives me joy. It makes me want to expand spaces and build little doors for people to come inside. At first I play games while I’m printing. The furniture is my building material, a pad of coloured paper my building site. I arrange an image with my building blocks and count the sheets of paper I have of one colour. While changing the arrangement with every print I pull, I perform a movement on the paper, it’s like testing a piece of choreography. With the last sheet I should have arrived in the same position I started with. The interlocking furniture, not meant to be printed from, has to be brought up to type height. Looking back I did some very unnecessary cutting of tiny paper strips to build a cushion for the furniture to sit on. With suggestions by some of the other printers the only layer I attach to the interlocking elements in the end is a strip of double-sided tape. I use A4 cutting mats with some cardboard underneath as a base for the furniture be stuck to. 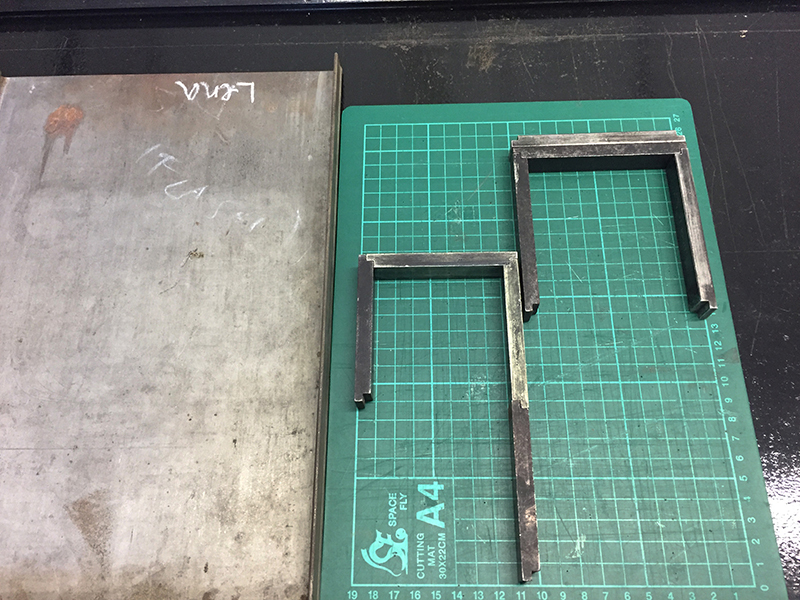 In this way I can quickly change the arrangement on the grid of the cutting mat and the interlocking furniture is easily detachable and stands on the base without any elements in between to hold the furniture. The first experimental month in which I took up a lot of space and made myself feel comfortable through this process was followed by a second month full of doubts and frustrations: a struggle to envision how all my works would look next to each other. I put pressure on myself to come up with an exhibition at the end of my three months and to give Simon and Ira a finished object that ideally represents some features of a book. Also, I would want to continue my practice after the time at this studio, right? How would that work? Would I hop as a nomad from workshop to workshop and invent spatial characters in a half real half fictional housing? In short, the concept of having finished uni finally finds my feet and twists them into cruel directions. Whilst I work out that I don’t have to crowd one publication with all my thoughts and trial prints, I start a wonderful and curious collaboration that presents my happy pocket in this doubtful second month. My friend Nora, also an artist-in-residence at LCBA for the summer, and I start sending each other letters, or rather we write the letter together and one of our pens is the repeated transport of the letter between our houses. We become messenger pigeons as well as the writers that send the letters. We start sentences and images, and after a couple of exchanges a collage has built up over several pages and imagined spaces. We give birth to a character that has an awkward personality. We keep him inside a drawer and narrate around and within this drawer. Back to my project that now has a title ‘SHAPE OF ACCESS – A magazine’​. I play with the supplement ​’– A magazine’​ because of one article from the PABD archive speaking about the magazine becoming an experimental space, now that the internet serves the previous purpose of a magazine, to give information. The internet freed the magazine in a way, now it is more of a platform that has flexibility depending on the context it presents. I continue learning to set type in the traditional way. Next to building images from the interlocking furniture I choose parts of the texts I’ve written and set them in Grot and Plantin fonts. 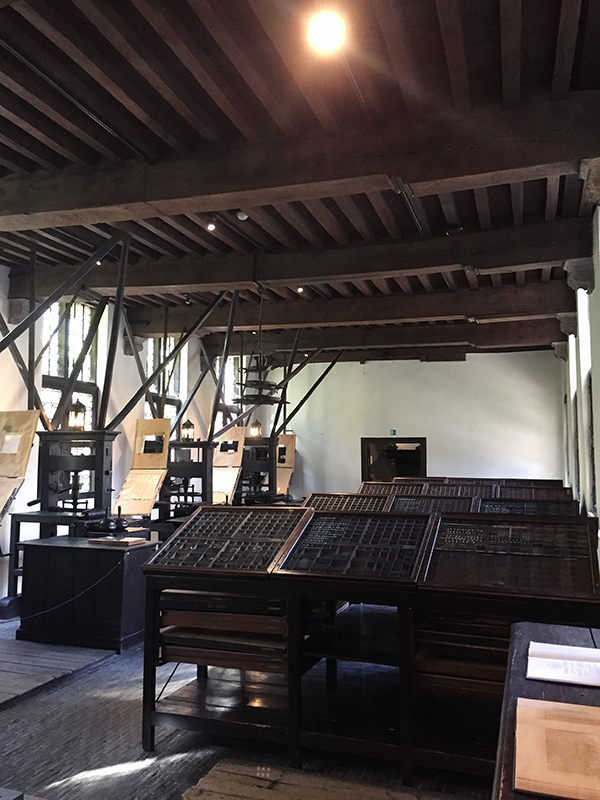 Plantin font mostly reminds me of my visit to the Plantin-Moretus-Museum in Antwerp and how inspiring the harbour city was thinking of distribution and advance. I still lay out some lines only as I set the type, but I notice myself getting quicker at measuring the lines and using the right gaps between words. The point and pica ruler in one, tweezers in the other hand, both slowly getting grey from the metal type, the process still has a lot to do with building: paragraphs move apart by inserting spacing material and the three-dimensional construction of furniture and type on the bed of the press has to function on the two-dimensional print held by sheets of paper. Over the course of three months I have built a collection of prints, they include writings, some of which can also be found in an A5 publication that I set up digitally. This is mainly because I don’t have enough time to print the whole book by letterpress next to the other prints that seem more important to be hand-printed. 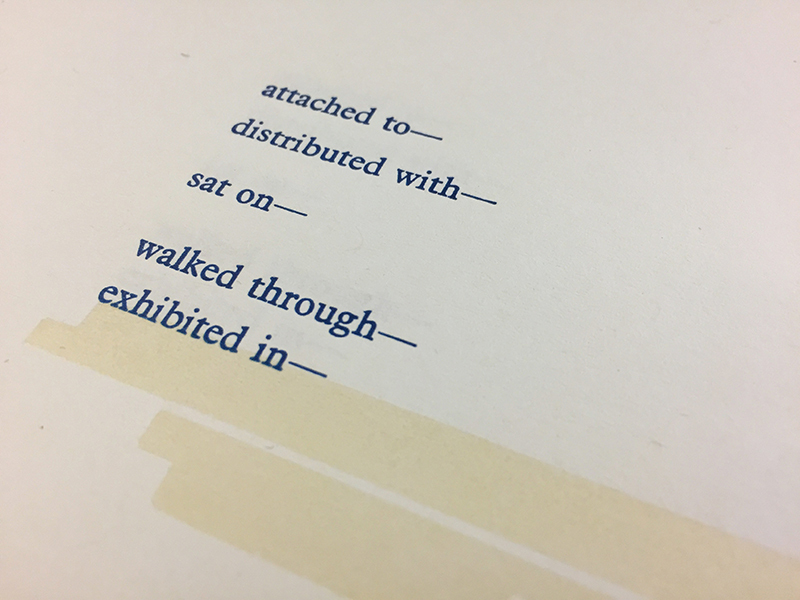 Each of my prints is an object, the publication with all its pages and content is one object that can be displayed with the prints, but can also be read independently. 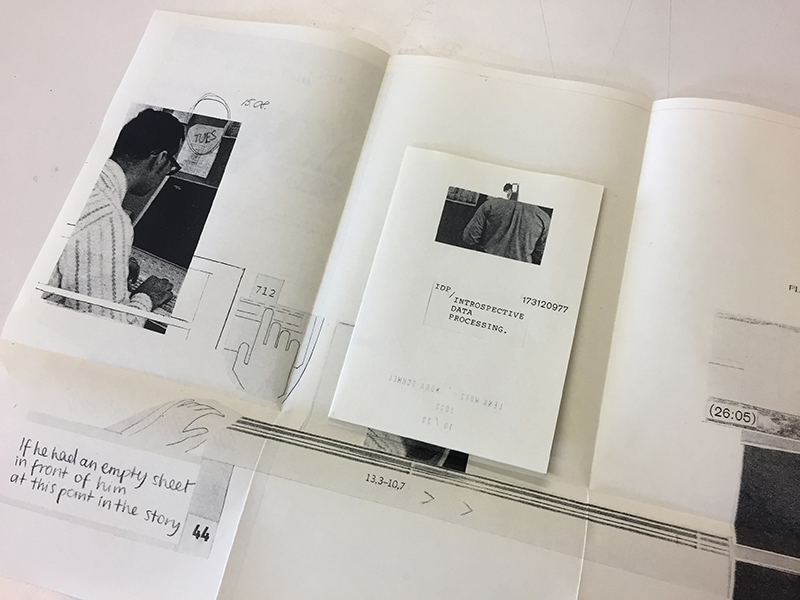 It consists of scanned elements of my drawings and texts printed by letterpress, transcriptions from library shelf marketing material and digitally inserted texts.